March 24, 2007: Cloudy and warm, Water temp 55* and stained. Got on the water at 4 this morning to collect bait and picked my clients up at 6:30am. Went a short distance and put out my spread of 10 planner boards and a bobber running the baits on points in about 10 foot of water. The first point we hit we put a 10 pounder in the boat for a good start of the day. As the sun rose so did the sounds of outboard motors and the breezes of an East wind. I had warned my clients weeks before that Saturdays are not the ideal time to fish Lake Anna in the spring. A very warm weekend day coupled with Bass tournaments were two strikes against us, but the East wind could really put a curse on the day. We continued to fish the area and got a couple more hits but the fish were only hitting the baits in the tail. I decided to move to a main lake flat where the water was clearer. We got 5 hits on the first pass before a troller almost ran over us. Along with a dozen other boats running over the flat the fish turned off. We moved to another flat and got numerous bites but after 30 minutes of fishing the combination of Jet Skies running through our spread and bass boaters running over us we had to move to a bay where we could just simply put out lines without being disturbed. 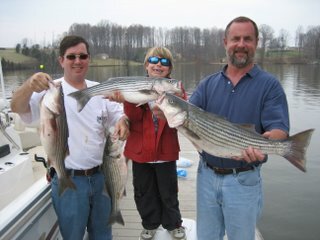 Anyway, we had 17 Strikes today, catching only 5 Stripers and a Catfish.